Hi Mike, that is really impressive. Excellent I look forward to seeing how the valve seats/combustion chambers assemble. Just awesome Mike. Don't know what else to say, just a work of art!! My friends at Crosthwaite and Gardner, have recently published this photo on there webpage. 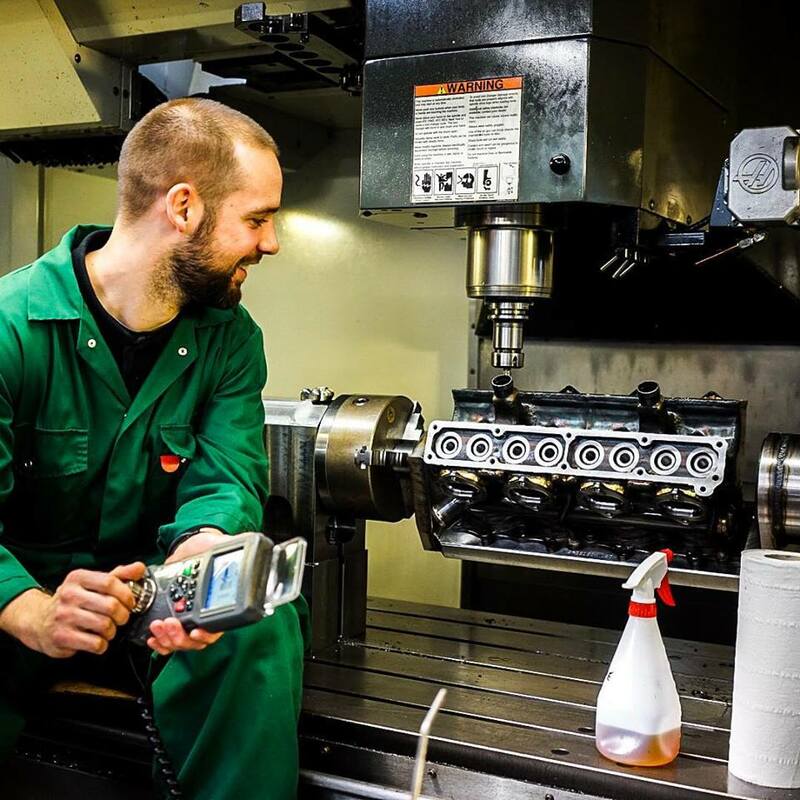 The caption says, "Clocking & setting the mill ready to machine valve seats on a fabricated cylinder block"
The cylinder block is from the 6.5litre Mercedes Benz W125 engine and the mill is a walk-in, drive -through, 4/5 axis workstation from Hass. The cylinder head is set over at the required angle on that massive 4th axis trunnion. He looks happy in his work, so would you or I, given half a chance to do the same. I wanted to ask about the epoxy for the exhaust port stubs, was it their regular stuff (500-600F), or a more specialized adhesive like this? ...screwed in bronze valve seats. Wow, going to watch for that. Watchmaker stuff. I am using the regular (500-600*F) JB Weld on the cylinder blocks. The blocks are water-cooled aluminium, so I don't expect a temperature gradient above 240*F, even around the exhaust ports. The regular JB Weld should have an ample operating temperature reserve (I hope). JB Weld has a high filler content, so does not go soft and gooey at higher temperatures, like an unfilled epoxy (eg. Araldite). The only problem with JB Weld with all those fillers, is the risk of tracking when subjected to EHT voltages; spark plugs, distributors etc. In order to avoid the "watchmaker stuff", I simplified the design and combined the valve guides and valve seats into one screw-in piece of bronze. That way I could ensure the valve guides, valve seats and the retainer thread were all concentric. The were so many valve guides (64, plus spares) to make, I welcomed the simplified design. It did consume an enormous amount of SAE 660 round bar. I realise that I have neglected posting progress on the Mercedes build for some time, I admit to having been completely distracted by the Bristol Jupiter. 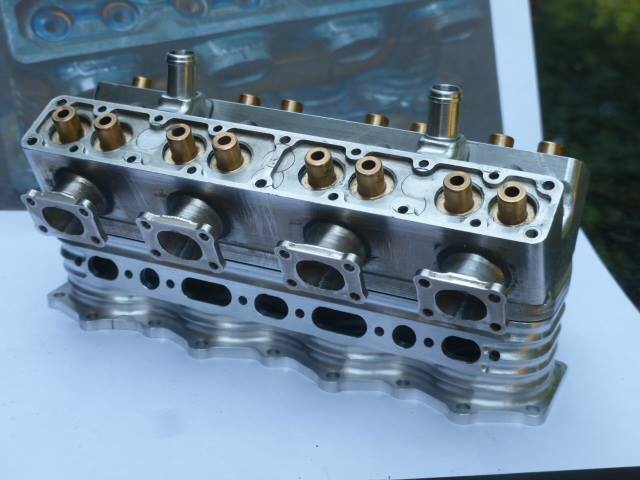 The previous Part 11D, of this build log, shows how the basic cylinder heads were machined from a solid billet. In this installment I will describe how I made and installed the combined valve guides and seats. For my two engines I needed to make 64 valve guides, plus some spares to cater for unforeseen circumstances. It came as a shock to realise I needed to order 2.5 metres (8 foot) of 10mm diameter SAE 660 bronze bar. The bronze bar was chopped up into 60mm lengths so the valve guides could be made two at a time to reduce the amount of material otherwise lost for work holding. To ensure concentrically, the valve cavity, the valve guide bore, the outer cylindrical and threaded portions were machined and reamed as a combined operation, all at the same setting. The bar was reversed in the collet chuck and the operation repeated on the opposite end. After the first stage of machining was completed, the embryo valve guides were cut in two, machined to length before the outer part of the valve guide stem was machined on all the valves. The valve guides are now ready for installation into the cylinder heads. I used the regular (500-600*F) JB Weld to grout and seal the valve guides into the cylinder blocks. The blocks are water-cooled aluminium, I don't expect a temperature gradient above 240*F, even around the exhaust ports, so the JB Weld should have an ample operating temperature reserve. You will notice the valve seats have been left with a sharp 90* edge. I intend to cut the seats to 45* and lap in the valves at a later stage. There has been too much repetitive work on the valve guides to even contemplate machining more than 64 valves at this stage. 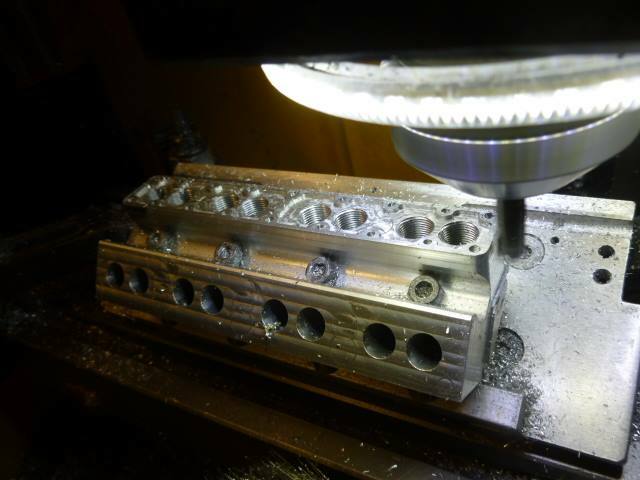 After the valve guides were finished, I turned my attention to machining the seats and tapping the four spark plug holes in each cylinder head 40 x 32 TPI. Then I turned my attention to the two coolant outlets, which screw into the top of the cylinder heads and take the hot coolant back to the radiator. I machined all the parts for the coolant outlet from a single block of aluminium. The finished part reminds me of some strange Martial Arts weapon. The individual parts were cut off the block, bored through before being filed to a smooth round shape. The tubular part of the coolant outlet pipe was turned and screw threaded. The whole assembly was then screwed into the cylinder head. 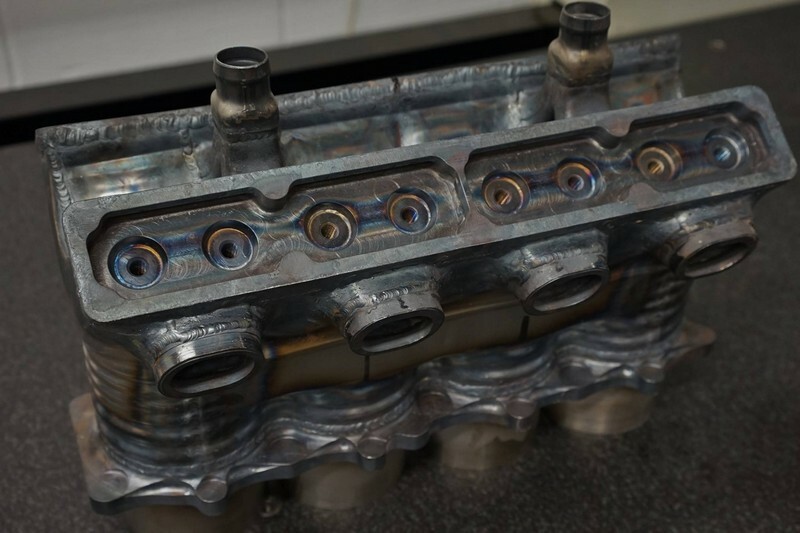 They were bonded and sealed into the cylinder head's water jacket with yet more JB Weld. The final set of photos show the (nearly) finished cylinder heads with the corrugated cylinder water jacket attached. The top photo shows a full size Mercedes W125 beautifully recreated by Crosswaite & Gardner. It was my inspiration for the quarter scale W165. Both are similar in concept and construction, but differ, both in size and in design details. The tea mug in the bottom photos says it all. I am always amazed at your work and so glad that you share these progress photos. Speechless Mike. Absolutely gorgeous work. Glad to see you sparing time from the Bristol to work on the MB W165. Wow that looks like a lot of very repetitive work on those valve guides. I hope you did them on a cnc machine. It's great to see the full size as well as the one on the coffee cup. Great work! That's awesome! Love watching you work Mike!!! Thanks everyone, for calling in and saying hello. It's greatly appreciated. With the demise of real world model engineering shows, our forum is taking over and becoming our own virtual model show, and one with a world wide audience. Roger, I do not know what I would do if Mr Happy failed the 'bounce off the floor' test one day. Bad Behavior has blocked 13851 access attempts in the last 7 days.